Last weekend, we celebrated my Dad’s birthday, and the only meat I had in the house big enough to feed everyone was a whole turkey. So I defrosted it, roasted it, and hoped there would be lots of left-overs for making soups and casseroles later in the week! I also made a bunch of extra mashed potatoes to use for my Cheesy Mashed Potato Soup (which I made earlier this week). To my delight, I was able to pick off about 6 cups of turkey from the bones after everyone had eaten their fill. However, I knew there was still usable meat left on the bones. So as I was cleaning up the kitchen after dinner, I put the entire turkey carcass and all the bones into my largest stock pot, covered it with water and starting simmering. I let it simmer about 5 hours (I know others who let it simmer over night). I let the broth cool for another hour and then strained out all the bones. 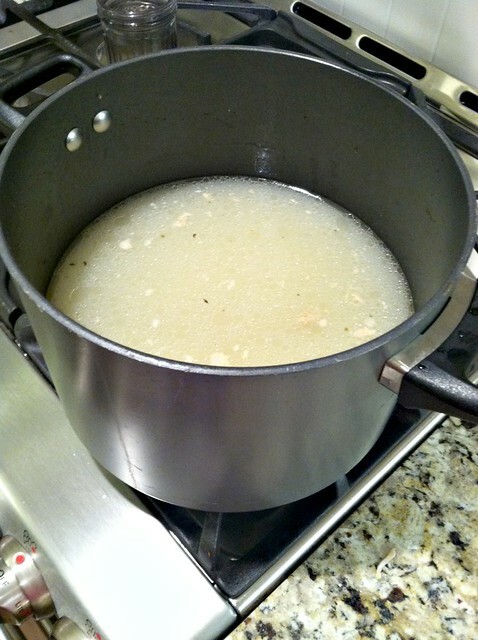 PLUS, I had 12 cups of yummy, homemade turkey broth that I divided up and froze. 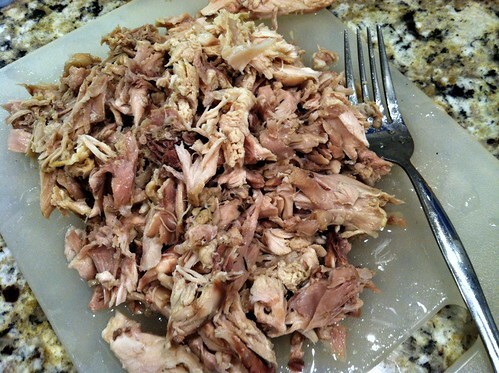 I’ll be able to use this extra shredded turkey and broth for all sorts of recipes over the next couple of months, and the broth alone will save me at least $12.00 (more if I can’t find it on sale). It only took me about 30 minutes of extra hands-on work to get the turkey off the bone and divided up into freezer containers — I’d say it was well worth my efforts! So out of my 10.5 pound turkey, I fed 8 hungry adults, ate leftovers for lunch the next day, and still had enough turkey and broth left over to create several additional meals! Not bad, especially since I got my turkey at the LOW price of $3.50 due to a special Thanksgiving sale + coupons! I do the same thing whenever I roast a whole chicken. I also make a delicious vegetable broth with any vegetables that might be a little past their prime. If you don’t have time to simmer the bones right away, simply put the full carcass in a freezer bag and freeze it for later. I didn’t add any spices or seasonings… just water, and the broth is still so flavorful. Freeze your broth and shredded meat in smaller portions (I usually do 2-3 cups) so it’s easier to defrost or just grab one container for your recipe. I’ve been told that you can actually boil the bones and carcass 2 or 3 times to make additional broth, but I don’t use that much broth, so I’ve only ever boiled the bones once. Buying turkey and chicken meat as a whole bird is a very frugal way to feed your family and stock your freezer. Even though it may seem like a lot of time up-front, it’s not always “hands-on” time… plus, you end up with food for your freezer, which will save you so much time in the long run. Do you have any other tips for making the most out of a whole turkey or chicken? 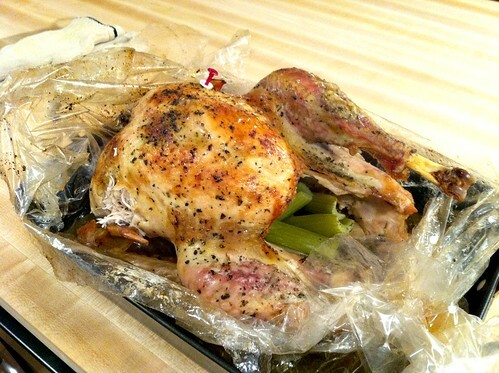 If you get a rotisserie chicken, there probably won’t be any juice to strain off. However, if you boil the bones — then you’ll eventually need to take all the bones out of the broth. I just use a large bowl with a strainer on top to strain out the bones, etc. You got a turkey for $3.50?! Holy cow Andrea! I have a big ole’ bird defrosting in my fridge that I will cook tomorrow in my roaster oven and do much the same as you – I just throw the bones in the crock pot and let them go for an entire day, the broth is SO good! Thanks for the soup recipes, I am in a soup making frenzy this winter! I frequently re-freeze food that has already been frozen and have never had negative side affects in the taste or quality of the food… so I would say it it’s totally fine to do. Kristen, I think that safety concern is for meat that’s been frozen, thawed, then frozen again (I still think it may still be safely done, although I’ve never tried this). However, meat that’s been cooked is perfectly safe to freeze. (ie. I freeze big batches of homemade spaghetti sauce all the time, casseroles, etc.) 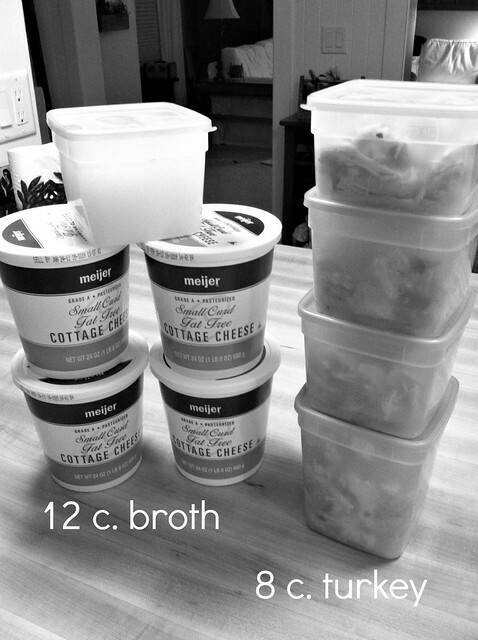 This is the convenience of “freezer cooking”….cooking in bulk, freeze some, reheat later. Andrea, I’ve never done this, but do you think I could do it with a rotisserie chicken from the grocery? So would I just put the whole thing ( after we’re done with it) skin, bones, and all in a big pot of water? If it’s that easy I’d be crazy not to try :-). Thanks as always! We do this with rotisserie chickens at least a few times a year. (We like to pick one up during our “staycations”). Anyway, we just pop our leftover bones, skin, etc in the slow cooker with enough water to cover the entire bird. Cook on low for 24-48hrs and you have tons of extra broth. The only problem I’ve had is when we got a new slow cooker that ran “hot” and the broth evaporated. So now, I double check the slow cooker before bed to make sure there is enough water. Yep, I do this all of the time. In addition to the broth, I also make a really good turkey cream soup and a yummy turkey pie. We do this all the time for whole chickens (which my husband often finds on sale at the grocery store). We wouldn’t have room to store a whole turkey long-term (but I might just have to make room, if we found a deal of $3.50 for an entire turkey!). We have a TON of chicken stock in our freezer (we use for soups, cooking rice, etc.). One tip I’ve learned is to store it in freezer bags, as they lay flat and take up less space. I am just now condensing the broth, done in a crockpot, from my turkey carcasses. I do tend to make a second batch of broth from the bones. Some people make several. It is not as rich, but I combine the batches before I store it. I know the bones have given up all the minerals they contain when even a big leg bone crushes easily with a spoon or my fingers. I condense it because I pressure can it to conserve freezer space and we use it a lot more than I thought we would. It makes a fabulous replacement for water when cooking rice or other grains and I use it to braise brussels sprouts or green beans, add it to the sauce for stir fry, in the sauce for mac and cheese or other casseroles, and my son even drank some hot after a recent bout of flu that had him feeling weak and dehydrated. I used to buy a couple dozen cans a year, but now I make my own for way less money, know exactly what it contains and use it almost daily. I put the carcass in the crock pot overnight with some garlic and onion peels that I kept in the freezer. The broth is delicious and there are supposed to be a lot of health benefits to it. I was just telling a patient last night that I do this to make chicken soup. It’s always so much better when I start with a carcus. I’ll also use the meat and leftover fixings for pot pies. Yum!